Humor me for a moment…. Take a slow, deep breath. Feel the air fill your lungs, every inch of them. Then put your hand up to your mouth, and let out that breath. Let the air slide out of your mouth and feel the warmth tickle your palm. What did most of you just do? You took a breath. It was controlled. It wasn’t painful (unless you have a cold, but let’s pretend you’re your normal self right now!) It allowed your body to supply much needed oxygen to your body, for your heart to pump it to your brain and your extremities. It allowed you to live. Now let me take you back to a moment I remember with horrifying clarity. Her nose flared as she worked hard to breathe. Her skin retracted between her ribs as she sucked in air, trying with every ounce of her tiny body to get enough oxygen into her lungs so her blood could carry it on. My baby girl tried SO hard. I saw it in her eyes. Determination. Willing herself to fight. I was so incredibly proud of her. I alerted a nurse though, and we agreed that her work was too much. 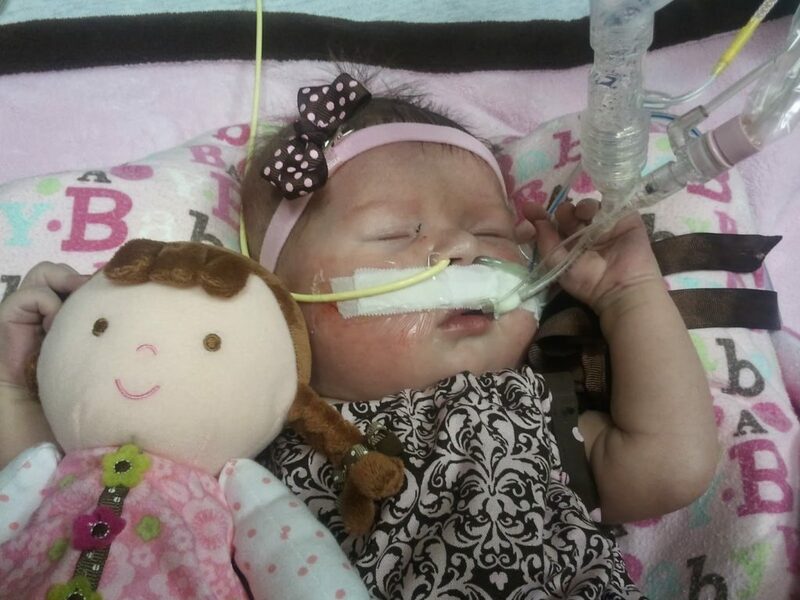 They drew blood and found that even though she was working SO hard to breath and doing a good job of keeping her saturations up on the outside, her blood was filling with Co2 at rates that were off the chart, because she couldn’t get enough oxygen. Doctors swarmed, and a tube was put down her throat, easing her load of doing the hard work of breathing. Take this scene and multiply it by 10 or more. I stopped counting the times my sweet girl fought so hard for each breath and had to be assisted with a tube down her throat. I remember thinking, as I watched my sweet girl, her chest rising and falling with the assistance of a ventilator for months on end, that I’d taken something so incredibly simple as breathing for granted. You breath in, and you breath out. Easy, right? But not for everyone. Countless kids live with some type of lung disease that makes breathing oh-so-precarious. Countless kids live with hearts that refuse to take that oxygen they are breathing to the rest of their body as they need to. Goodness, it’s not even just kids. So many adults suffer as well. My list of thankfulness knows no end. I started to list my “30 days of thankfulness” but then last week, Annabelle woke in the middle of the night with a fever of 103.4. A simple virus, but her breathing made my heart skip a beat. Her nose flared. Her breaths were coming at one per second with grunts in between, and she struggled to keep her oxygen saturations where they needed to be. It earned her a trip to the emergency room and some oxygen to help her through. She’s fine. It WAS just a virus. Her body is just NOT fond of fevers. She came home, feeling much better, about 10 hours later. Discussion: What is something you are thankful for? Maybe something basic and simple that you normally wouldn’t even think to be thankful for? Is there something God has opened your eyes to lately? This is good. Food for thought, for sure. Thanks for sharing and have a great Thanksgiving!